Very nice! I adore cocktails anyway but something so frothy with coconut and pineapple sounds wonderful. Now we’ve got the perfect accompaniment with these lovely maple candied nuts of yours! You know, I’m not into cocktails much but this looks great and may even push over the wine when the weather gets hot. My brother lived in the Cayman islands for a year and was doing Scottish voice-overs for ads in the voice of Sean Connery. Who knows, perhaps he was living on this stuff! Ha! You sound like me – I couldn’t entire glass of that admittedly delicious piña colada, though I want nothing more than to do just that. Guess I’ll be saving this recipe for when I want to make a small glass for myself at home though! Thanks for sharing, Maureen! i wish i can afford that fancy kitchen toys!!! the pina colada looks refreshing too…. I love a good piña colada! As does Mrs KR — it’s one of her favorite drinks. I usually shake them up, but really need to do a blender version again. Yours looks perfect. Love the story, too. 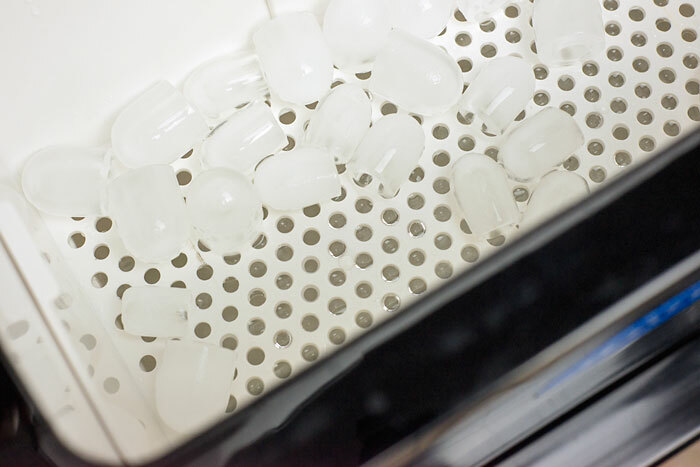 And that ice maker looks pretty nifty! This looks like a wonderful ice maker and Drink recipe! Sounds like a really great ice cube maker and drink recipe! That IS a good husband especially when you’ve got a pina colada buzz on. Coco lopez is my friend. It’s good in pina colada cheesecake as well. 🙂 I wish my blender would crush/grind ice. Right now, whatever ice is formed is immediately melted by the overheating motor. Ahhh, this is a lovely cocktail! Ok, I think you’re going to have to have a party now that you’ll have ice to fill coolers! Lucky! So that’s the cure for sea sickness. I’m going to try a glass or two of those good looking pina colada you have there. This TOTALLY reminds me of the Caribbean! And it is like candy. Dangerous! Except my glasses are way too small for the Carib! Hello Maureen, glad I found your blog. This cocktail looks so amazing! I love coconut with pineapple, and back home (in Brazil) we experiment all kind of recipes with them together. I’m going to pin your recipe, and I’ll try it with no doubt. By the way, your cocketail picture is so beautiful, it’s perfection. Thanks, Regina, lovely to meet you! That Pina Colada looks delicious! And what a nice memory of your cruise as well. The first thing I would make with a bucket of ice would be a strawberry daiquiri!! I love those too, Courtney! I just got back from a vacation in the Dominican Republic and I couldn’t get enough of the pina coladas!! I usually don’t drink when I go out to dinner, but since I was on vacation I treated myself to a LOT of these. This looks just as delicious! The coco lopez stuff is the best for making drinks! Well, well, well, just what the doctor ordered with 90″F in California today! I’ll take 2 please and a nap! It has been years since I had a pina colada and being the cheap date that I am, it may only take one! This is a beautiful drink and giggling sounds pretty great too! What a perfect appliance for the girl who has everything! Especially one who lives in a tropical area. Cool drink! Summer is coming to my area, I hope, the would be the perfect drink to cool off. Sound like a really nifty ice maker. That looks like a very good Pina Colada. I’m in Hawaii for a week and they have a lot wicked drinks that tastes fantastic. If we were in Germany we would say “Prost” . I thought I just posted but I’m not sure. That’s a very good looking Pina Colada. I’m in Hawaii for a week and they have some wicked drinks here with lots of rum and fresh fruit . ice cold Mocha Frappe, weight watchers friendly! You reminded me of Vegas. I swear I went to the card tables just to gulp down glasses of fabulous pina colda. This looks pretty close. So yummm! I did not know you can buy a portable ice cube maker. This is totally brilliant and very ergonomic as well. If I was lucky enough to win one I would pick some lemons from the tree and make a decadent frozen margarita like we used to buy at the old Bourbon and Beefsteak in Kings Cross. In huge glasses topped with a lemon slice and indeed, a straw it would be divine with fresh ice cubes. Your Pina Colada looks very inviting. I’m in Hawaii for a week and they have some wicked drinks with fruit and lot of rum. Brings me back to a wild few weeks my Momma and I spent in Puerto Rico many years ago, the resort we were staying at had the most magical happy hour prices, the Aussie in us sure emerged then. LOL! Need to get me one of these ice makers, there never seems to be enough. I always wanted an ice maker on the fridge but with this there’s no need! Very clever! Wow, imagining sweet, rhummy, coconutty and cold! Two for the road, please!! 5 stars!!! Wow that is an impressive amount of ice! You could start up your own business with the prices they charge at the servos. Delicious looking drink! Just hope all that ice doesn’t break your blender. Great machine, but luckily I’ve got a huge fridge with generally only has ice cubes and ice cream in it! OMG! THat pina colada is just orgasmic! I imagine lots of margaritas and pina coladas if I win one… Woot wooot! Thanks, and so glad you had a lovely vacation! I first had pina coladas in Panama and I’ve been obsessed with them ever since! The photos in this post are lovely, by the way! This is my kind of cocktail! And having a portable ice maker would be pretty convenient. That looks spectacular!!!! I have always thought Pina Colados were too sweet – as you thought too after your first sip . This looks more like ice cream. YUM!!! either. I do get sea sick at times. And boy howdy I don’t envy you the headache that drink ‘gave’ you. Ha! I know and I forgave him too. sort of makes me a saint, don’t you think? It’s 90 degrees right now and one of these coladas would be fabulous – that creamy texture looks heavenly! Bring on the rum ;). Piña Colada is the favourite’s cocktail of my husband ! Your frozen version will love it ! Lol @ you. And THIS cocktail? My fave. Made them last night and well I had to ask my husband the same question your friend asked you! It looks absolutely heavenly and perfect for the coming summer! Oooh, this would be a yummy way to cool off on a hot summer’s day! It looks perfect–though who knows what I’d do if I drank two!! Lightweight here. I’d make Chocolate Frappes, and save myself from spending a fortune at a certain fast food “Cafe” when the family and I get the hankering for delicious icy drinks. I have been craving a Pina Colada for a week. I have m ingredients and headed to the kitchen. When I exit you can bet i’ll Have a yummy frozen pina in my hand .